The local company that supplied aero service into, and out of, Warri International Aeroport had a pilot named Bob. Bob wasn't Russian. Matter-of-fact, Bob would go on at length -- in a nigh-unintelligible Russian accent, usually while potted on vodka, and waving his arms with their Cyrillic tattoos -- as to his not-Russian-ness. This being West Africa at the time, the old hands simply agreed with him, and ignored his singing of Soviet marching songs at the top of his lungs at three in the AM. Bob was also an excellent pilot, and his baby was a C-119 Flying Boxcar that was the major hauling aeroplane for our little patch of the jungle. The company that Bob worked for had an extremely logical training process. If you were brand-new to Africa, you would fly with an old Africa hand until said worthy decided you were less-inclined to prang an expensive aeroplane (and kill yourself in the process, but that wasn't as important), and you got a plane. Well, Bob got this new kid with a brand-new pilot's licence and a hankering to see Africa -- and it was not a happy match. Seems like Africa wasn't exactly matching up to the kid's expectations; high on the list being the fact that Bob was frequently one-and-a-half sheets to the wind when flying. One day the kid stomps onto the 'plane past the locals, the livestock, something angry in a sack (Fact: if you get on a bush cargo plane with bunch of locals, there is always something angry in a burlap sack.) up to the flight deck, where he learns that Bob isn't aboard. Short search finds Bob -- completely and totally fit-shaced -- asleep in the pilot/radio shack/tower. This is the Last Straw as far as Junior is concerned. There are regulations, damn it! Junior goes and grabs another newbie -- this one apparently still with egg yolk behind his ears -- and our intrepid birdmen mount their steed for the trip into Lagos. The locals, who aren't exactly gormless, immediately grab Co-Pilot Egg-Tooth, gently loft him out the back door, carry Bob from the pilot shack, plant him in the left seat and begin to ply him with coffee, all much to the sputtered indignation of Junior. Bob surfaces enough to figure out 'up' from 'down' (fairly important for a pilot, I'm told), and they take off. Not very long in the air, and the locals decide to celebrate their victory by building a fire on the back deck and spit-roasting Angry Sack for brekkie. Angry Sack apparently held opinions most firm about this, and as soon as the sack came open, did a runner. This, of course, led to the locals snatching up machetes and tear-arsing off after their breakfast. Angry Sack made three laps through the flight-deck (the locals only made two) before Junior Lost His Tiny Little Mind, screamed, leapt to his feet, vaulted into the back and uttered thundering denunciations of Africa in general, and the passengers in particular. Fingers were waved! Regulations were cited! Heritage, manners, sexual proclivities, and level of civilization were denounced in fine rolling language to the deep appreciation of the locals, who were passing a gurgling jug around the back deck in silent admiration of a fine oration. Unfortunately, Junior didn't realize that his vault into the back of the aerocraft had landed him standing four-square in the campfire built for the roasting of Angry Sack. When the C-119 landed in Lagos, Junior was carried off in a litter to a standing ovation -- which he apparently didn't appreciate in the least -- but before being loaded into the ambulance managed to snarl a series of promises to Bob, not the least of which was that Junior believed that not even the Nigerian government would let Bob fly anywhere without a co-pilot, and that would give Junior enough time to have Bob's licence to fly yanked. Bob belched meditatively, and while the plane was being refueled, he wandered over to the edge of the tarmac, paid ten Naira for a chimpanzee and another Naira for the gimme hat the chimp's previous owner was wearing. He then boarded the plane, buckled the ape into the co-pilot's seat, crammed the gimme hat onto the chimpanzee's head, clamped the radio headset over the hat, and took off for Warri International. Fast-forward to the landing, my father and his best friend are in the radio shack, just kind of chilling. Dad is sipping his first cup of coffee and Tom is swearing creatively at his whiz wheel. In comes Bob's plane and my father comments, thoughtfully, "I wonder where the chimp got that hat?" Tom immediately bounds to his feet in shock. "Honestly, Jim! You Yanks! I can't believe you just ... Bedamned. That's a monkey." Dad takes another sip, "Bet he's sober." I'm seeing a lot of yik-yak banging around the media and the Internet regarding student loan debt. Said yik-yak usually involving some Special Snowflake who has racked-up five or six figures worth of student loans getting a (less-than-useful) degree. 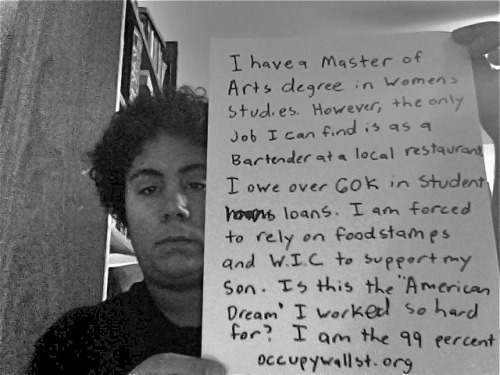 Seems these folks want the loans they got for their poorly-chosen degree plan forgiven -- which is Socialist-speak for "Everybody else needs to pay for my degree in Gender Studies/ Sub-Saharan Basket Weaving/ Puppetry Arts/ WhatTheHellEver". 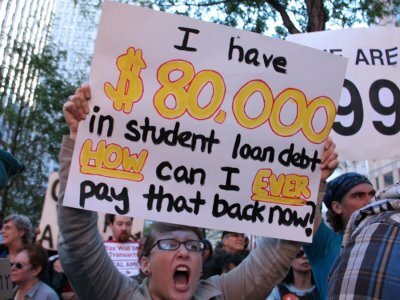 It has apparently become such a brass ring for the Media that a significant part of Bernie Sanders' campaign is about Student Debt; and a great deal of the allure of the Nordic Model to the Usual Useful Idiots is the "free college education". 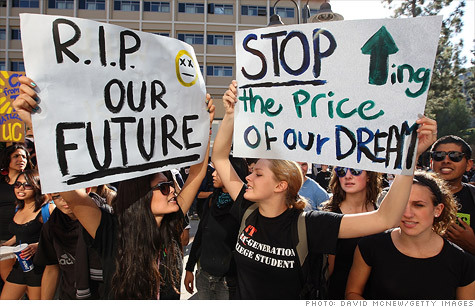 Setting aside the fact that abso-damn-lutely NOTHING is free, we here at The LawDog Files do actually have some sympathy for those poor students who have racked up stupid amounts of debt in pursuit of a useless degree, but -- unlike the politicians or the media -- we have discovered that there is an existing way to not only take care of that crippling debt, but to be actually socially useful. ... You can have your entire debt forgiven. Minus 120 reduced loan payments during that period. I am sure that the above person will be ecstatic to learn that the Los Angeles Police Department is hiring! Ten good years street time and that debt goes away. I am pleased to inform all three of the above that the United States Army is still recruiting. Honourable Discharge after ten years -- or more -- and all that debt is written off. Good news, young ... Thing ... The New York City Fire Department is hiring. Ten years of running into burning buildings, saving kittens, and other karma-improving activities, and your $80,000 parchment receipt will be forgiven. 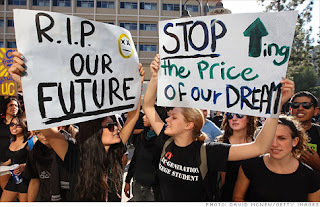 The Public Service Loan Forgiveness Program. Granted, you have to be useful for ten years, but it is there.